PAWTUCKET, R.I. -- After thoroughly dominating three levels of minor league baseball over the last season and a half, Mookie Betts has now made it up to the final test before the majors. Despite coming off his third promotion in a calendar year, Betts hardly seems phased by the increased level of competition at Triple-A. So far Betts has gone 7 for 24 against the more advanced Triple-A pitching, and though he didn’t have a hit in his home debut, he showed an advanced approach. His best at-bat on the evening was an eight-pitch walk to lead off the game in which he fouled off three pitches. Finishing the game 0 for 3, he made a point afterwards to say that the process is far more important than the hits that result. That is a common refrain among hitters in the minors, but is still impressive perspective for someone who has batted .311 in their minor league career and had eye-popping results recently. The way Pawtucket manager Kevin Boles describes what he has seen out of Betts so far, you can see why he has that confidence. 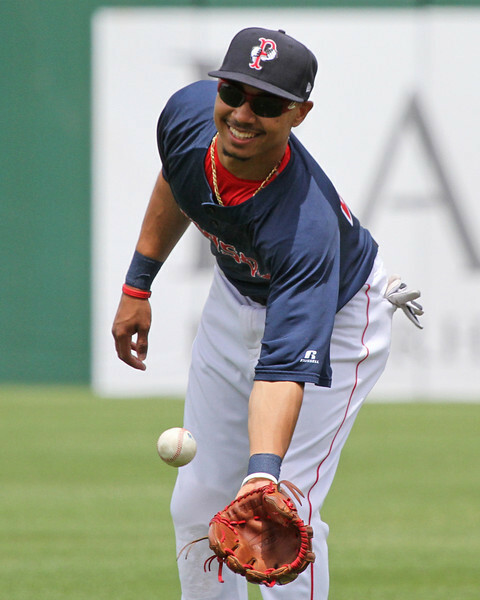 Betts played center field Saturday, his third game there in what is now a stretch of four games in a row following two starts at second base upon his promotion. He has played the position 16 times in 23 games since his debut in center on May 18. One play stood out in the seventh, in which a ball was hit on a line directly over his head and he made a quick move to come in, but recovered in time to move backwards to make the catch. Betts said that the main things he has been working on are routes to cut off balls in the gaps and simply which man to hit on throws to the infield. According to Boles, the plan is to continue to alternate Betts between second base and center field, with no set schedule. One thing Boles was clear on was that there are no plans to play him in a corner outfield spot at this point. In preparation to join the major league team, it might make sense to eventually get Betts some experience in the corners to expand his versatility. This is true in particular given Jackie Bradley’s brilliance defensively in center despite his struggles at the plate, while the club’s corner outfielders have either struggled in all facets or been injured. But for now, the team wants Betts to focus on adjusting to center only. Should the time for another adjustment—whether to the majors or another new position—one thing that Betts has made clear over the last year is his ability to step up to new challenges time and time again.